(Ulmus japonica x wilsoniana’ Morton’) is characterized by arching limbs and a graceful vase shape like that of the classic American Elm. Its glossy dark green foliage changes to yellow in the fall and is resistant to elm leaf beetle feeding as well as Dutch Elm Disease and Phloem Necrosis. 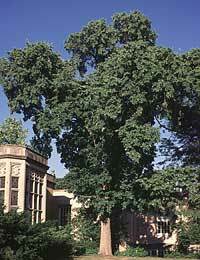 This fine cultivar derives from an outstanding specimen tree growing at Morton Arboretum (pictured).